This site is the highest rated DHSOTM winner of all time. 8.58 - Highest Rated Winner Ever! Unlike back in 2007 when I was disqualified by the same people who have now succeeded in banning me from the entire DreamHost community, this time they can't say anything. Proving that no matter how much they badmouth this site DreamHost customers aren't fooled by it, proof of which is their giving me a historic win for the 2nd time. 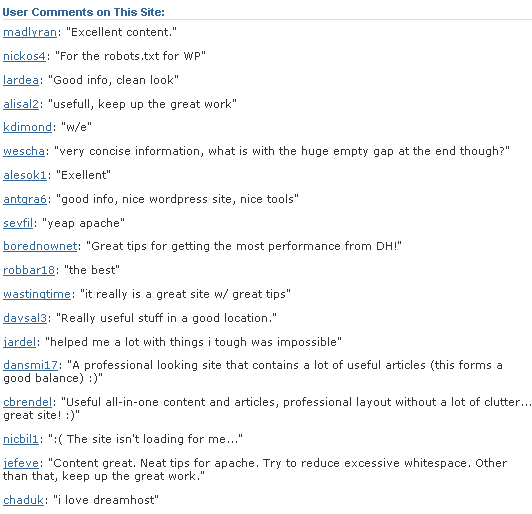 DreamHost has been running this contest for a long time, and the high rating that you all gave to me has proved to be historic, making this site the highest rated website in the history of the DHSOTM. 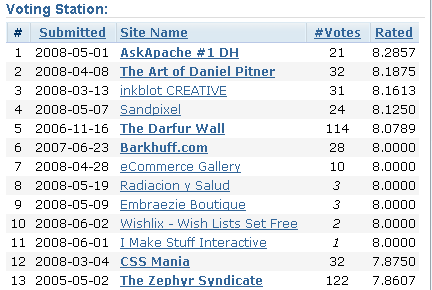 I really appreciate eveyone voting for me, its been a tough year having to defend myself against the 2 self-important haters badmouthing me all over the net, and it feels good to have unbiased third-parties validate my belief that this blog is here for everyone with the goal of spreading free knowledge on the art of pimping out websites.